Getting a jump on things for 2017! 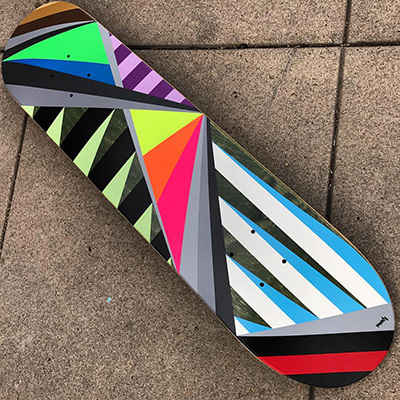 I’ll be traveling all over the East Coast for the rest of 2016 so I pumped out this deck here at the San Diego studio while I can still count on the warmer weather. Here’s “Fractal #37” Montana Cans (official) on green marble stained skate deck. 7 ply hard rock maple constructed in North America. Franklin 2 part glue system 7.375” wide x 31.00” long. Available at the upcoming Three Year Anniversary exhibit at La Bodega Gallery on January 14, 2017.